Baglung – Noted leader of ruling Communist Party of Nepal (CPN) Jhalanath Khanal has opined for establishing socialism of Nepali character. At the greetings exchange and tea reception hosted by CPN Baglung chapter here on Saturday, leader Khanal, also the former Prime Minister, argued for completing the task of establishing socialism in keeping with the spirit of constitution. 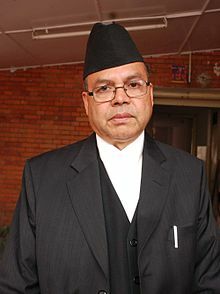 "Establishing socialism in the country was one of the main objectives of the constitution," Khanal said. On another note, he argued for changing the election model as it was becoming costlier day by day.